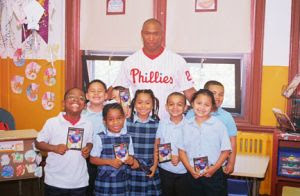 Philadelphia Phillies hitting coach Milt Thompson stands with students of Holy Name School, Camden. A star contributor for the 1993 National League Champion Phillies, Thompson offered inspirational words, talked about his own life and goals, and read to the younger children. These were just a few of the inspiring words Philadelphia Phillies hitting coach Milt Thompson imparted to students of Holy Name School in Camden last Tuesday, driving home (no pun intended) the importance of always bettering one’s self.